How far is Venus from Earth? Venus is the closest planet to Earth (it’s also the most similar in size). But its proximity to our planet depends on the orbits of both. The two planets travel in ellipses around the sun, and so the distance between them is constantly shifting. At its farthest, Venus lies 162 million miles (261 million kilometers) away. Venus takes 224.7 Earth days to travel around the sun. It makes its closest approach to Earth about once every 584 days, when the planets catch up to one another. On average, it is 25 million miles (40 million km) away at this point, though it can reach as close as 24 million miles (38 million km). All of the planets orbit the sun in an ellipse, rather than a circle, but Venus has the most circular orbit of the planets. On average, the distance to Venus from the sun is 67 million miles (108 million km). At its closest (perihelion), it is only 66.7 million miles away (107 million km); at its farthest (aphelion), only 67.7 million miles (108.9 million km) separate the two. Venus isn’t the brightest planet in the sky because it is the closest to the sun; Mercury bears that honor. But unlike Mercury, Venus has a thick, cloudy atmosphere that reflects the light better than Mercury’s rocky surface (it also keeps the planet piping hot). This causes it to stand out, brighter than any star even at its dimmest. When Italian astronomer Galileo Galilei studied Venus with a telescope, he was astonished to find that it had phases. Like the moon, these phases depended on where the planet and the sun lay in relationship to the Earth. The phases of Venus were used as evidence that Venus, like the other planets, orbited the sun rather than the Earth in the Copernican model of the solar system. Because Venus lies inside of the orbit of the Earth, it periodically transits, or crosses, the sun, blocking out a portion of the star. If the planets traveled within the same plane of the solar system, this would happen on a frequent basis. Instead, Venus has an orbit that is inclined by 3.4 degrees with respect to Earth, so sometimes it tends to pass outside of the range. Combining information about Venus’ 1639 transit with the principle of parallax allowed for the most accurate estimates of the distance from the Earth to the sun at the time. How long does it take to get to Venus? The time it takes to travel to Venus depends not only on what speed a rocket can obtain but also on the path a spacecraft travels. Space agencies frequently use gravity boosts from moons, the sun, and other planets to accelerate a craft without using fuel. In 1962, NASA’s Mariner 2 became the first spacecraft to send back information from another planet. Launched on August 27, 1962, it performed a flyby of the planet on Dec. 14, having taken less than four months to reach Venus. The Soviet Union launched Venera 7 on Aug. 17, 1970. On Dec. 15 of that same year, it landed on Venus and became the first spacecraft to send back information from another planet. It took slightly more time to reach Venus than Mariner 2, but still fell short of the four-month mark. The most recent terrestrial visitor Venus was NASA’s Magellan spacecraft, which took up orbit around the shining planet. Launched on May 4, 1989, it began its orbital insertion movement on Aug. 7, 1990, having taken a more roundabout trip after scheduling issues following the Challenger disaster. 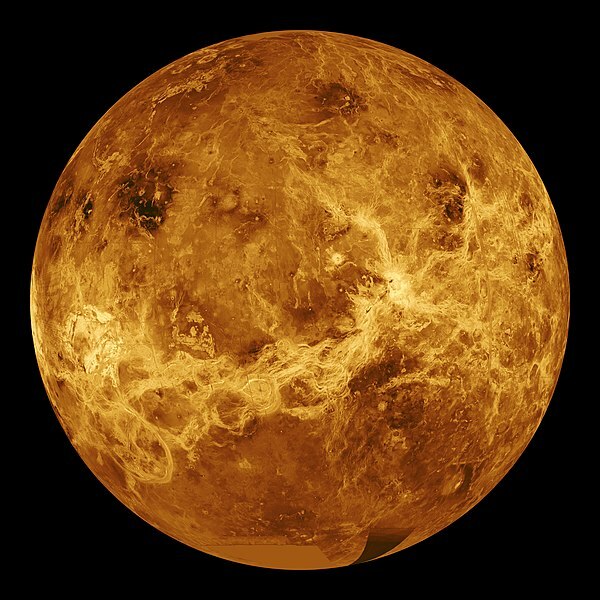 Magellan mapped the surface of Venus in depth. The promised warranty on the Spirit rover was 90 Martian days (or “sols“). It ended up lasting more than 2,200 sols and gave a window into Mars’ early and wet history. But there was one obstacle Spirit couldn’t overcome: an unexpected sand trap. NASA spent weeks trying to help the robot on to safer ground, with little headway. Trapped, the rover eventually stopped transmitting information back to Earth. The rover left behind a trove of scientific information about Mars history. It also paved the way for a more robust rover to follow: Curiosity, which is still exploring the Red Planet today. Spirit is one of a suite of spacecraft in NASA’s second wave of Mars exploration. The agency sent several missions to Mars in the 1960s and 1970s, but paused after the Viking 1 and Viking 2 landers in the 1970s did not bring back definitive evidence of current or past life. According to the agency, interest in Mars began to turn again in the 1980s and 1990s, as research on Earth uncovered microbes not only surviving, but thriving in extreme environments such as underwater volcanic vents. Further, the Viking pictures showed possible evidence that the area had water in the past. NASA sent Mars Global Surveyor to the planet in 1996 to map out possible water sites, and also placed the Mars Pathfinder and Sojourner rover mission to the surface in 1997 with great scientific and public success. This spurred enough interest for more rovers. NASA ultimately launched two rovers towards Mars: Spirit, and Opportunity. More formally known as the Mars Exploration Rovers, the machines received their names from 9-year-old Sofi Collis following a naming contest. Spirit and Opportunity together cost $800 million and carried a large collection of scientific equipment. They had panoramic cameras to scope out their surroundings, and a small spectrometer that could seek out signs of heat on the surface. Each rover also had an arm, which carried tools such as a microscopic imager to get a close-up look at rocks on the surface. It took two years of wrangling for scientists and engineers to agree on landing sites for Opportunity and Spirit. “The places most appealing to scientists (the side of a cliff, for example, on which the planet’s history is recorded in layers of sedimentary rock) are often the most frightening to engineers charged with the robot’s safety,” NASA wrote of the process. Photo of sunset on Mars taken by NASA’s Spirit rover in 2005. Spirit’s destination was Gusev Crater, which stretches bigger than the state of Connecticut. From MGS pictures, scientists were pretty sure the crater held water in the ancient past. Gusev itself was dug out by an asteroid or comet impacting the planet as early as 4 billion years ago. Spirit was the first of the rovers to leave Earth. It blasted off from Cape Canaveral on June 10, 2003, and was on its way to Mars within hours. Seven months later, on Jan. 3, 2004, Spirit made its final descent to Mars. After snapping open a parachute, the rover careened to the surface in a cocoon of airbags, rolling safely to a stop on the surface. Right on target in Gusev, too. Opportunity also landed safely and at the right spot, on Jan. 25. Spirit was still sitting in its landing shell when it spotted the first possible signs of water in the distance: carbonate, which often forms in wet environments. “We came looking for carbonates. We have them. We’re going to chase them,” said Phil Christensen, one of the Spirit scientists, in a press release. But within a week, Spirit was in trouble. It stopped sending data from the surface on Jan. 21, 2004. Within two days, NASA later determined the rover’s computer was perpetually rebooting due to a software error; it restarted more than 60 times in three days. The agency stabilized the rover in February. Then, in March, Spirit hit a jackpot: it found a volcanic rock that had hints of a watery past in its composition. Three months later, NASA was surprised when Spirit stumbled across hematite, which is a mineral that can form in water. Opportunity also found hematite at its landing site halfway across Mars. By late 2005, Spirit had driven up a nearby landmark, Husband Hill, to take a look at the landscape around it. It was the first time a rover climbed a hill on another planet. The area was a testament to Mars’ early violent history, NASA said. “We’ve got this dramatic topography covered with sand and loose boulders, then, every so often, a little window into the bedrock underneath,” stated science instruments principal investigator Steve Squyres at the time. One of Spirit’s wheels quit in March 2006 as the rover was racing to a slope to get enough sunlight to last the winter. NASA dragged the wheel behind the rover, slowly moving Spirit an hour a day as the sun’s strength allowed. It safely arrived at its destination in April. The location proved to be a good spot to stop, as the rover found “water-altered minerals” nearby when it resumed operations in late 2006. Spirit journeyed 4.8 miles (7.7 kilometers) during its years on Mars, more than a dozen times the distance that NASA planned to travel. Spirit soldiered on despite a spite of mechanical and Martian difficulties. Funny enough, the tricky wheel ended up being useful to the mission; in March 2007, NASA announced the rover churned up some soil that had sulfur and water traces in it. As the year passed, it uncovered the site of a possible volcanic outburst, and survived an extensive dust storm. Another storm in late 2008 put Spirit’s power down to concerning levels, but the rover pulled through. Martian winds cleared some of the dust away in February 2009. In April, Spirit began to have rebooting trouble from its computer again, with periods of what NASA described as “amnesia.” The rover began driving again as NASA worked to fix the problem, but then ran into a worse problem: sinking sand. The rover unexpectedly broke through a crust on April 23 into softer sand, and couldn’t get out again. On Dec. 31, 2009, NASA warned there may not be enough power to last the winter. Spirit’s last communication came on March 22, 2010, and it remained silent as NASA spent months hailing it. “Engineers’ assessments in recent months have shown a very low probability for recovering communications with Spirit,” NASA wrote in a press release on May 24, 2011. Besides, the space assets being used to look for Spirit would soon be needed for Curiosity. NASA concluded its efforts to reach Spirit that month. However, the rover’s place in history is secured from its six years of discovery on the Red Planet. Jupiter is the largest planet in the solar system. Fittingly, it was named after the king of the gods in Roman mythology. In a similar manner, the ancient Greeks named the planet after Zeus, the king of the Greek pantheon. Jupiter helped revolutionize the way we saw the universe and ourselves in 1610, when Galileo discovered Jupiter’s four large moons — Io, Europa, Ganymede and Callisto, now known as the Galilean moons. This was the first time celestial bodies were seen circling an object other than Earth, major support of the Copernican view that Earth was not the center of the universe. Jupiter is the most massive planet in our solar system, more than twice as massive as all the other planets combined, and had it been about 80 times more massive, it would have actually become a star instead of a planet. Its atmosphere resembles that of the sun, made up mostly of hydrogen and helium, and with four large moons and many smaller moons in orbit around it, Jupiter by itself forms a kind of miniature solar system. All told, the immense volume of Jupiter could hold more than 1,300 Earths. The colorful bands of Jupiter are arranged in dark belts and light zones created by strong east-west winds in the planet’s upper atmosphere traveling more than 400 mph (640 kph). The white clouds in the zones are made of crystals of frozen ammonia, while darker clouds of other chemicals are found in the belts. At the deepest visible levels are blue clouds. Far from being static, the stripes of clouds change over time. Inside the atmosphere, diamond rain may fill the skies. a giant hurricane-like storm seen for more than 300 years. At its widest, the Great Red Spot is three times the diameter of the Earth, and its edge spins counterclockwise around its center at a speed of about 225 mph (360 kph). The color of the storm, which usually varies from brick red to slightly brown, may come from small amounts of sulfur and phosphorus in the ammonia crystals in Jupiter’s clouds. The spot grows and shrinks over time, and every now and again, seems to fade entirely. Jupiter’s gargantuan magnetic field is the strongest of all the planets in the solar system at nearly 20,000 times the strength of Earth’s. It traps electrically charged particles in an intense belt of electrons and other electrically charged particles that regularly blasts the planet’s moons and rings with a level of radiation more than 1,000 times the lethal level for a human, damaging even heavily shielded spacecraft such as NASA’s Galileo probe. The magnetosphere of Jupiter, which is composed of these fields and particles, swells out some 600,000 to 2 million miles (1 million to 3 million km) toward the sun and tapers to a tail extending more than 600 million miles (1 billion km) behind Jupiter. Jupiter spins faster than any other planet, taking a little under 10 hours to complete a turn on its axis, compared with 24 hours for Earth. This rapid spin makes Jupiter bulge at the equator and flatten at the poles, making the planet about 7 percent wider at the equator than at the poles. Jupiter broadcasts radio waves strong enough to detect on Earth. These come in two forms — strong bursts that occur when Io, the closest of Jupiter’s large moons, passes through certain regions of Jupiter’s magnetic field, and continuous radiation from Jupiter’s surface and high-energy particles in its radiation belts. These radio waves could help scientists to probe the oceans on its moons. Chemical composition: Jupiter has a dense core of uncertain composition, surrounded by a helium-rich layer of fluid metallic hydrogen, wrapped up in an atmosphere primarily made of molecular hydrogen. Internal structure: A core less than 10 times Earth’s mass surrounded by a layer of fluid metallic hydrogen extending out to 80 to 90 percent of the diameter of the planet, enclosed in an atmosphere mostly made of gaseous and liquid hydrogen. Jupiter has at least 63 moons, which are often named after the Roman god’s many lovers. The four largest moons of Jupiter, now called Io, Europa, Ganymede, and Callisto, were discovered by Galileo Galilei himself, and are appropriately known today as the Galilean satellites. Ganymede is the largest moon in our solar system, larger even than Mercury and Pluto. It is also the only moon known to have its own magnetic field. The moon has at least one thick ocean between layers of ice, although it may contain several layers of both materials. Io is the most volcanically active body in our solar system. The sulfur its volcanoes spew out gives Io a blotted yellow-orange appearance that is often compared to a pepperoni pizza. As Io orbits Jupiter, the planet’s immense gravity causes ‘tides’ in Io’s solid surface that rise 300 feet (100 meters) high, generating enough heat for volcanic activity. The frozen crust of Europa is made up mostly of water ice, and it may hide a liquid ocean holding twice as much water as Earth does. Icy oceans may also exist beneath the crusts of Callisto and Ganymede. Some of this liquid spouts from the surface in newly spotted sporadic plumes at the southern pole. Its potential to host life caused NASA to request funding for a mission to explore Europa. Callisto has the lowest reflectivity, or albedo, of the four Galilean moons. This suggests that its surface may be composed of dark, colorless rock. Jupiter’s three rings came as a surprise when NASA’s Voyager 1 spacecraft discovered them around the planet’s equator in 1979. Each are much fainter than Saturn’s rings. The main ring is flattened. It is about 20 miles (30 km) thick and more than 4,000 miles (6,400 km) wide. The inner cloud-like ring, called the halo, is roughly 12,000 miles (20,000 km) thick. The halo extends halfway from the main ring down to the planet’s cloud tops and expands by interaction with Jupiter’s magnetic field. Both the main ring and halo are composed of small, dark particles. The third ring, known as the gossamer ring because of its transparency, is actually three rings of microscopic debris from three of Jupiter’s moons, Amalthea, Thebe and Adrastea. It is probably made up of dust particles less than 10 microns in diameter, about the same size of the particles found in cigarette smoke, and extends to an outer edge of about 80,000 miles (129,000 km) from the center of the planet and inward to about 18,600 miles (30,000 km). Ripples in the rings of both Jupiter and Saturn may be signs of impacts from comets and asteroids. Seven missions have flown by Jupiter — Pioneer 10, Pioneer 11, Voyager 1, Voyager 2, Ulysses, Cassini and New Horizons — while another, NASA’s Galileo, actually orbited the planet. Pioneer 10 revealed how dangerous Jupiter’s radiation belt is, while Pioneer 11 provided data on the Great Red Spot and close-up pictures of its polar region. Voyager 1 and 2 helped astronomers create the first detailed maps of the Galilean satellites, discovered Jupiter’s rings, revealed sulfur volcanoes on Io, and saw lightning in Jupiter’s clouds. Ulysses discovered the solar wind has a much greater impact on Jupiter’s magnetosphere than before suggested. New Horizons took close-up pictures of Jupiter and its largest moons. In 1995, Galileo sent a probe plunging towards Jupiter, making the first direct measurements of its atmosphere and measuring the amount of water and other chemicals there. When Galileo ran low on fuel, the craft was intentionally crashed into Jupiter’s atmosphere to avoid any risk of it slamming into and contaminating Europa, which might have an ocean below its surface capable of supporting life. Another spacecraft, named Juno, is heading toward Jupiter and will reach the planet in 2016. It will study Jupiter from a polar orbit to figure out how it and the rest of the solar system formed, which could shed light on how alien planetary systems might have developed. As the most massive body in the solar system after the sun, the pull of Jupiter’s gravity has helped shape the fate of our system. It may have violently hurled Neptune and Uranus outward, according to calculations published in the journal Nature. Jupiter, along with Saturn, may have slung a barrage of debris toward the inner planets early in the system’s history, according to an article in Science magazine. It may even nowadays help keep asteroids from bombarding Earth, and recent events certainly have shown that it can absorb potentially deadly impacts. Currently, Jupiter’s gravitational field influences numerous asteroids that have clustered into the regions preceding and following Jupiter in its orbit around the sun. These are known as the Trojan asteroids, after three large asteroids there, Agamemnon, Achilles and Hector, names drawn from the Iliad, Homer’s epic about the Trojan War. If one were to dive into Jupiter’s atmosphere, one would discover it to grow warmer with depth, reaching room temperature, or 70 degrees F (21 degrees C), at an altitude where the atmospheric pressure is about 10 times as great as it is on Earth. Scientists have conjectured that if Jupiter has any form of life, it might dwell at this level, and would have to be airborne. However, researchers have found no evidence for life on Jupiter. In early December, NASA will take an important step into the future with the first flight test of the Orion spacecraft — the first vehicle in history capable of taking humans to multiple destinations in deep space. And while this launch is an un-crewed test, it will be the first peek at how NASA has revamped itself since the end of the Space Shuttle Program in 2011. While the space shuttle achieved many ground-breaking accomplishments, it was limited to flights in low-Earth orbit (approx. 250 miles high). Its major goal, over the program’s last 10 years, was to launch and assemble the International Space Station, where the risks and challenges of long duration human space flight can be addressed and retired. With the ISS construction complete, NASA is in the process of handing over supply and crew transportation missions to private industry, so NASA can focus on what’s next – deep space exploration. And this first flight test of Orion is a significant milestone on the path to get us there. The flight itself will be challenging. Orion will fly 3,600 miles above Earth on a 4.5-hour mission to test many of the systems necessary for future human missions into deep space. After two orbits, Orion will re-enter Earth’s atmosphere at almost 20,000 miles per hour, reaching temperatures near 4,000 degrees Fahrenheit, before its parachute system deploys to slow the spacecraft for a splashdown in the Pacific Ocean. While this launch is an important step to taking humans farther than we’ve ever gone before, it is important to note that it also reflects the fact that, after 30 years of space shuttle missions dominating its human spaceflight activities, NASA has reevaluated everything – from its rockets and launch facilities to how it designs and manages its programs. NASA has now infused innovation and flexibility into everything it does. With the Orion spacecraft, NASA wanted to develop a vehicle that could fly for decades with the flexibility to visit different destinations and safely return astronauts to Earth as the nation’s exploration goals evolve. As capable as the Apollo capsule was, the longest round trip mission to the Moon took 12 days. Orion is designed as a long-duration spacecraft that will allow us to undertake human missions to Mars – a two year round trip. In addition, NASA built enough capability into Orion so there is no need for redesign, or to start up a new program, as new destinations are identified. Innovation and flexibility are also evident with the ground infrastructure. At Kennedy Space Center (KSC) in Florida, NASA has eliminated the ground systems and launch pads that were built specifically for the space shuttle. They have developed a “clean pad” approach that can be used by a variety of launch vehicles. The new streamlined infrastructure will be much more cost-efficient, reducing the time for on-the-pad processing from 30 days, the space shuttle’s timeline, to just five to six days. The key to launching Orion on deep space exploration missions is NASA’s new “super rocket.” Known as the Space Launch System (SLS), it will be the most powerful rocket in history. The enormous power of the SLS will provide the capability to go farther into our solar system than humans have ever gone before. It will enable launches to other planets in less than half the time of any existing rocket. And, like Orion and the new ground systems at KSC, it is designed to be flexible and evolvable to meet a wide variety of crew and cargo mission requirements. The SLS is an absolute game-changer for ambitious robotic missions to the outer planets and large unprecedented astronomical observatories. Those missions will build on the discoveries of Curiosity on Mars, the Hubble Space Telescope and its successor, the James Webb Space Telescope, and multiple robotic missions in the years ahead. Through the development of the SLS and Orion, NASA has learned many lessons on how to streamline the design to make it more affordable than past systems. For the early missions, SLS will use heritage space shuttle hardware for the liquid engines and solid rocket boosters. Also, instead of initially building the “full-up” SLS, NASA has designed it to evolve by planning upgraded upper stages and boosters that future missions will require in the 2020’s and 2030’s. These innovations have allowed SLS to stay on a relatively flat budget throughout its design phase. Even the way NASA manages its programs has been revamped. The Agency’s management structure for systems engineering and integration has been streamlined to increase communication and enhance decision-making. Strong communication has led to increased precision, and the potential cost avoidance is close to $100 million per year. Evidence of these savings can be seen in the successful completions of Preliminary Design Reviews for Orion, SLS and KSC ground systems. As a nation, the U.S. has not sent crews beyond low Earth orbit since the last Apollo crew walked on the Moon in 1972. With Orion and SLS, America will have the fundamental capabilities to support missions taking the next steps into deep space, and with innovation and flexibility at the foundation of these programs, NASA is literally building a “Highway” for deep space exploration that will be sustainable for decades to come. This is exciting. I hope this project actually does what NASA says it will. It means we may be finally taking space exploration more seriously. NASA’s Curiosity Mars rover has completed a reconnaissance “walkabout” of the first outcrop it reached at the base of the mission’s destination mountain and has begun a second pass examining selected rocks in the outcrop in more detail. This small ridge, about 3 feet (1 meter) long, appears to resist wind erosion more than the flatter plates around it. Such differences are among the rock characteristics that NASA’s Curiosity Mars rover is examining at selected targets at the base of Mount Sharp. The ridge pictured here, called “Pink Cliffs,” is within the “Pahrump Hills” outcrop forming part of the basal layer of the mountain. This view is a mosaic of exposures acquired by Curiosity’s Mast Camera (Mastcam) shortly before a two-week walkabout up the outcrop, scouting to select which targets to examine in greater detail during a second pass. Pink Cliffs is one of the targets chosen for closer inspection. This image combines several frames taken with the Mastcam on Oct. 7, 2014, the 771st Martian day, or sol of Curiosity’s work on Mars. The color has been approximately white-balanced to resemble how the scene would appear under daytime lighting conditions on Earth. Exposed layers on the lower portion of Mount Sharp are expected to hold evidence about dramatic changes in the environmental evolution of Mars. That was a major reason NASA chose this area of Mars for this mission. The lowermost of these slices of time ascending the mountain includes a pale outcrop called “Pahrump Hills.” It bears layers of diverse textures that the mission has been studying since Curiosity acquired a drilled sample from the outcrop in September. In its first pass up this outcrop, Curiosity drove about 360 feet (110 meters), and scouted sites ranging about 30 feet (9 meters) in elevation. It evaluated potential study targets from a distance with mast-mounted cameras and a laser-firing spectrometer. During a second pass up the outrcrop, the mission is using a close-up camera and spectrometer on the rover’s arm to examine selected targets in more detail. The second-pass findings will feed into decisions about whether to drill into some target rocks during a third pass, to collect sample material for onboard laboratory analysis. Before examining Pelona, researchers used Curiosity’s wheels as a tool to expose a cross section of a nearby windblown ripple of dust and sand. One motive for this experiment was to learn why some ripples that Curiosity drove into earlier this year were more difficult to cross than anticipated. While using the rover to investigate targets in Pahrump Hills, the rover team is also developing a work-around for possible loss of use of a device used for focusing the telescope on Curiosity’s Chemistry and Camera (ChemCam) instrument, the laser-firing spectrometer. Diagnostic data from ChemCam suggest weakening of the instrument’s smaller laser. This is a continuous wave laser used for focusing the telescope before the more powerful laser is fired. The main laser induces a spark on the target it hits; light from the spark is received though the telescope and analyzed with spectrometers to identify chemical elements in the target. If the smaller laser has become too weak to continue using, the ChemCam team plans to test an alternative method: firing a few shots from the main laser while focusing the telescope, before performing the analysis. This would take advantage of more than 2,000 autofocus sequences ChemCam has completed on Mars, providing calibration points for the new procedure. Curiosity landed on Mars in August 2012, but before beginning the drive toward Mount Sharp, the rover spent much of the mission’s first year productively studying an area much closer to the landing site, but in the opposite direction. The mission accomplished its science goals in that Yellowknife Bay area. Analysis of drilled rocks there disclosed an ancient lakebed environment that, more than three billion years ago, offered ingredients and a chemical energy gradient favorable for microbes, if any existed there. Curiosity spent its second year driving more than 5 miles (8 kilometers) from Yellowknife Bay to the base of Mount Sharp, with pauses at a few science waypoints. NASA’s Mars Science Laboratory Project is using Curiosity to assess ancient habitable environments and major changes in Martian environmental conditions. JPL, a division of the California Institute of Technology in Pasadena, built the rover and manages the project for NASA’s Science Mission Directorate in Washington. NASA Marshall Space Flight Center, Huntsville, Ala. 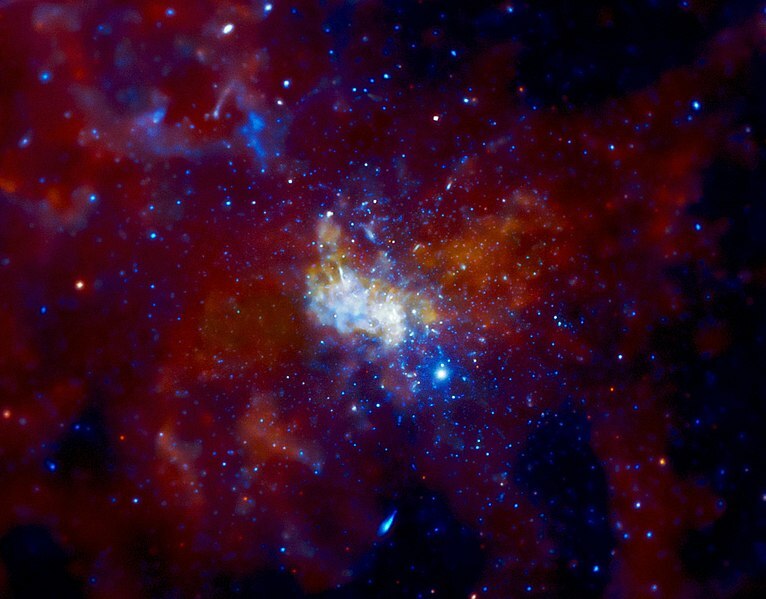 The giant black hole at the center of the Milky Way may be producing mysterious particles called neutrinos. If confirmed, this would be the first time that scientists have traced neutrinos back to a black hole. 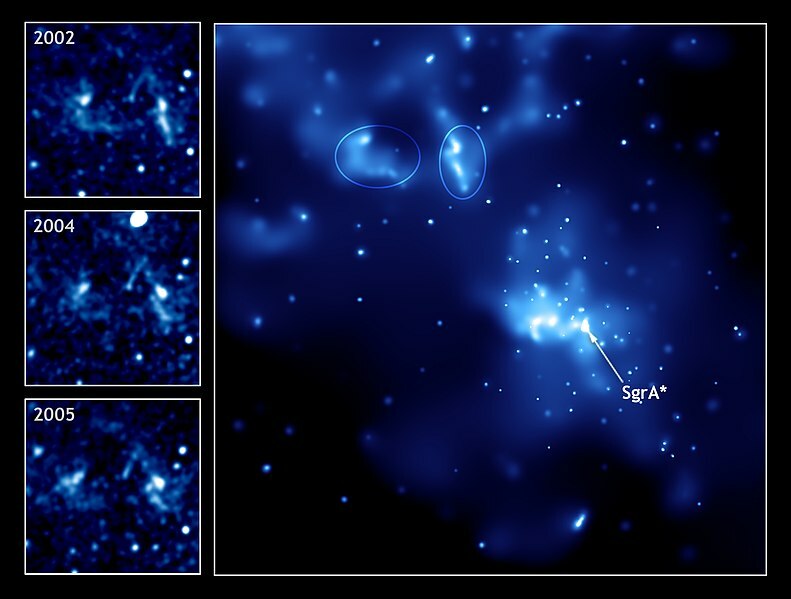 The evidence for this came from three NASA satellites that observe in X-ray light: the Chandra X-ray Observatory, the Swift gamma-ray mission, and the Nuclear Spectroscopic Telescope Array (NuSTAR). Neutrinos are tiny particles that carry no charge and interact very weakly with electrons and protons. Unlike light or charged particles, neutrinos can emerge from deep within their cosmic sources and travel across the universe without being absorbed by intervening matter or, in the case of charged particles, deflected by magnetic fields. The Earth is constantly bombarded with neutrinos from the sun. However, neutrinos from beyond the solar system can be millions or billions of times more energetic. Scientists have long been searching for the origin of ultra-high energy and very high-energy neutrinos. Because neutrinos pass through material very easily, it is extremely difficult to build detectors that reveal exactly where the neutrino came from. The IceCube Neutrino Observatory, located under the South Pole, has detected 36 high-energy neutrinos since the facility became operational in 2010. By pairing IceCube’s capabilities with the data from the three X-ray telescopes, scientists were able to look for violent events in space that corresponded with the arrival of a high-energy neutrino here on Earth. In addition, several neutrino detections appeared within a few days of flares from the supermassive black hole that were observed with Swift and NuSTAR. Scientists think that the highest energy neutrinos were created in the most powerful events in the Universe like galaxy mergers, material falling onto supermassive black holes, and the winds around dense rotating stars called pulsars. The team of researchers is still trying to develop a case for how Sagittarius A* might produce neutrinos. One idea is that it could happen when particles around the black hole are accelerated by a shock wave, like a sonic boom, that produces charged particles that decay to neutrinos. The paper describing these results is available online. NASA’s Marshall Space Flight Center in Huntsville, Alabama, manages the Chandra program for NASA’s Science Mission Directorate in Washington. The Smithsonian Astrophysical Observatory in Cambridge, Massachusetts, controls Chandra’s science and flight operations. Chandra, Spitzer ]and associated programs. NASA shares data with various national and international organizations such as from the Greenhouse Gases Observing Satellite. Researchers at Simon Gilroy’s lab in the Department of Botany at the University of Wisconsin-Madison this afternoon greeted a truck carrying small containers holding more than 1,000 frozen plants that germinated and grew aboard the International Space Station. On Tuesday, when Gilroy’s team inspected the plants at the Kennedy Space Center in Florida, they saw exactly what they wanted: Petri dishes holding seedlings that sprouted and grew in weightlessness. After their arrival in Madison, the plants went directly into a deep freeze. After being thawed in a few months, they will donate their RNA to an instrument that will measure the activity of all of their approximately 30,000 genes. The other half of the experiment represents a departure for Gilroy, and for NASA, the agency supporting this area of space research. After these plants undergo a similar genetic analysis at UW-Madison’s Biotechnology Center, the data will get an initial check-over from Gilroy’s group. 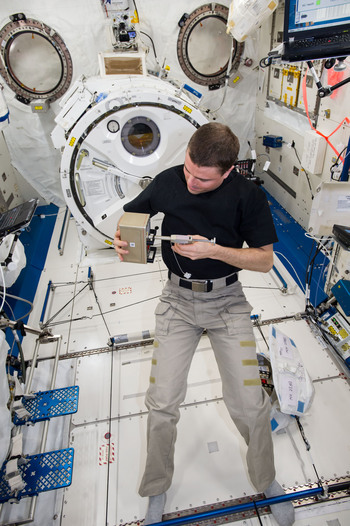 And then a treasure trove of digital data on plant genetic activity in microgravity will be made available to any researcher interested in mining it. Through the process called transcription, genes produce RNA that becomes the template for proteins, and in both sets of experiments, the RNA data will show which genes become more or less active in microgravity, when compared to an identical set of plants grown on Earth. Samples of Arabidopsis plants identical to those that grew in space. It turns out that the same signaling system used to detect mechanical stresses like gravity is also used to defend against pathogens. That may explain why plants in space appear more susceptible to disease. That overlap raises the stakes for understanding the impact of gravity on plants beyond the notion of building stronger crops that can stand up in the field. Understanding the signals could help in the never ending battle against plant disease. 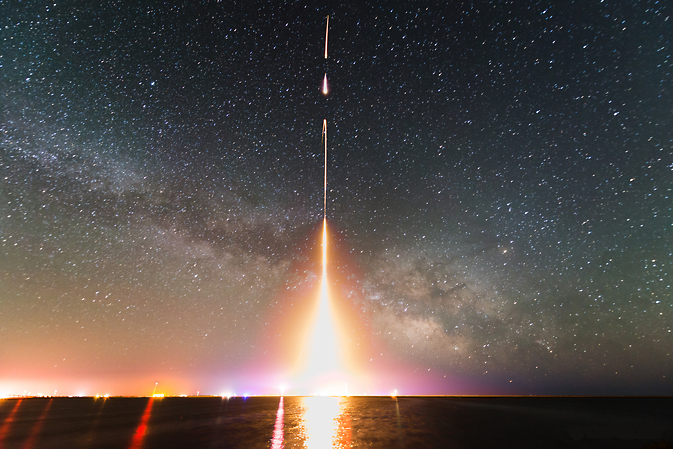 A NASA sounding rocket experiment has detected a surprising surplus of infrared light in the dark space between galaxies, a diffuse cosmic glow as bright as all known galaxies combined. The glow is thought to be from orphaned stars flung out of galaxies. This is a time-lapse photograph of the Cosmic Infrared Background Experiment (CIBER) rocket launch, taken from NASA’s Wallops Flight Facility in Virginia in 2013. The image is from the last of four launches. The findings redefine what scientists think of as galaxies. Galaxies may not have a set boundary of stars, but instead stretch out to great distances, forming a vast, interconnected sea of stars. Observations from the Cosmic Infrared Background Experiment, or CIBER, are helping settle a debate on whether this background infrared light in the universe, previously detected by NASA’s Spitzer Space Telescope, comes from these streams of stripped stars too distant to be seen individually, or alternatively from the first galaxies to form in the universe. Using suborbital sounding rockets, which are smaller than those that carry satellites to space and are ideal for short experiments, CIBER captured wide-field pictures of the cosmic infrared background at two infrared wavelengths shorter than those seen by Spitzer. Because our atmosphere itself glows brightly at these particular wavelengths of light, the measurements can only be done from space. During the CIBER flights, the cameras launch into space, then snap pictures for about seven minutes before transmitting the data back to Earth. Scientists masked out bright stars and galaxies from the pictures and carefully ruled out any light coming from more local sources, such as our own Milky Way galaxy. What’s left is a map showing fluctuations in the remaining infrared background light, with splotches that are much bigger than individual galaxies. The brightness of these fluctuations allows scientists to measure the total amount of background light. To the surprise of the CIBER team, the maps revealed a dramatic excess of light beyond what comes from the galaxies. The data showed that this infrared background light has a blue spectrum, which means it increases in brightness at shorter wavelengths. This is evidence the light comes from a previously undetected population of stars between galaxies. Light from the first galaxies would give a spectrum of colors that is redder than what was seen. Future experiments can test whether stray stars are indeed the source of the infrared cosmic glow. If the stars were tossed out from their parent galaxies, they should still be located in the same vicinity. The CIBER team is working on better measurements using more infrared colors to learn how stripping of stars happened over cosmic history. Results from two of four CIBER flights, both of which launched from White Sands Missile Range in New Mexico in 2010 and 2012, appear Friday, Nov. 7 in the journal Science. Safely sending human explorers to and from Mars will be the challenge of a generation. We don’t yet know what clues astronauts will uncover in the Martian soil or atmosphere that reveal new knowledge about our solar system, but one thing is certain, Mars contains critical resources that can sustain human presence. Harvesting those resources will be key to pioneering the Red Planet. To enable missions deeper into space than ever before, NASA is investing in technologies for In-Situ Resource Utilization (ISRU)—the ability to find and use natural resources beyond Earth. This includes refining and storing consumables like breathable air, drinkable water, and even using them to grow food. With ISRU, future astronauts may even be able to create rocket fuel and 3D printed parts and structures by using locally sourced minerals. In the short-term, ISRU is one of the key capabilities NASA needs to help astronauts rely less on supplies from Earth and become more self-reliant on expeditions far from home. An artist concept image of where seven carefully-selected instruments will be located on NASA’s Mars 2020 rover. The MOXIE payload is identified in the lower center location of the image. It will take humans more than six months to reach Mars with current propulsion systems. Because of the orbit of the planets around the sun, astronauts either will have to leave Mars within 30 days or stay on the planet for more than 500 days. The ability to leverage Mars resources could greatly reduce the cost of both mission types. NASA will soon test ISRU experiments that could help overcome this challenge. 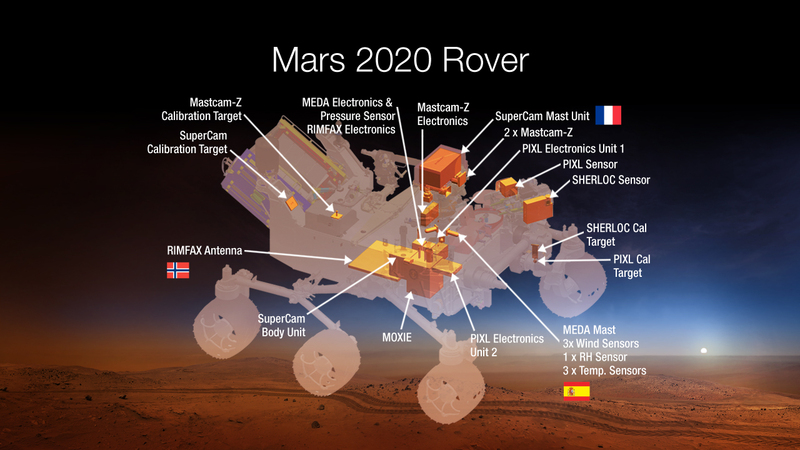 In August, NASA announced the suite of instruments destined for Mars aboard the agency’s Mars 2020 Rover. One of these instruments, the Mars Oxygen ISRU Experiment (MOXIE), will convert carbon dioxide collected from the Martian atmosphere into oxygen. 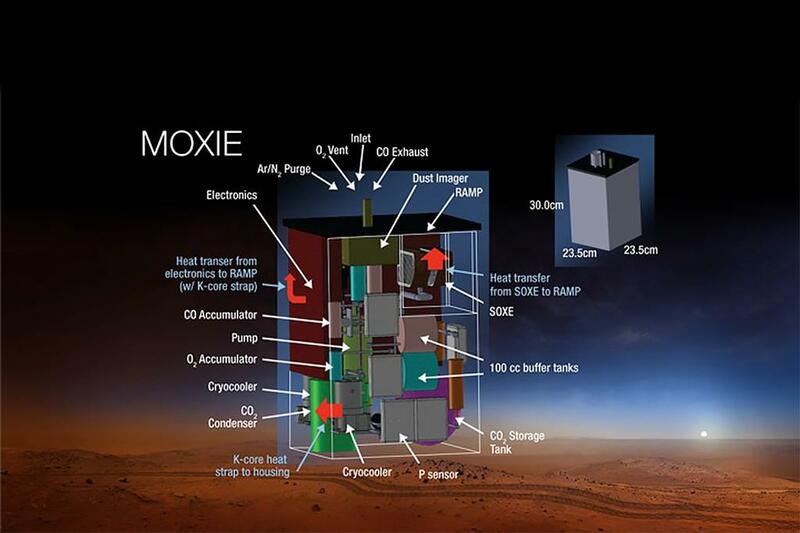 The MOXIE system, once demonstrated on Mars, could be scaled for future human missions as a way to replenish their life support. They could even use the oxygen to fuel an ascent vehicle to leave the Martian surface and begin the voyage home. The ability to produce oxygen on Mars decreases the amount of cargo we will need to launch in advance of human missions or send with crews, which could significantly decrease the costs of those missions as well. In this concept image, a resource prospector carrying a RESOLVE payload roves on the lunar surface. Learning to live off the land beyond Earth is not limited to Mars, though. NASA is developing a plan to launch the Resource Prospector with the Regolith and Environment Science and Oxygen and Lunar Volatile Extraction (RESOLVE) experiment. Resource Prospector will land on the south pole of the moon and carry RESOLVE on a rover to find, characterize and map ice and other substances in almost permanently shadowed areas. The concept includes multiple science instruments that will help identify volatiles in the lunar soil (or “regolith”), such as hydrogen and water ice. An on-board oven will separate the natural resources from soil samples. In the future, water and oxygen extracted from lunar soil through methods tested by RESOLVE could be used for life support. Two recent NASA spacecraft around the moon found that its craters are rich in methane and hydrogen as well—useful gases for propellant. 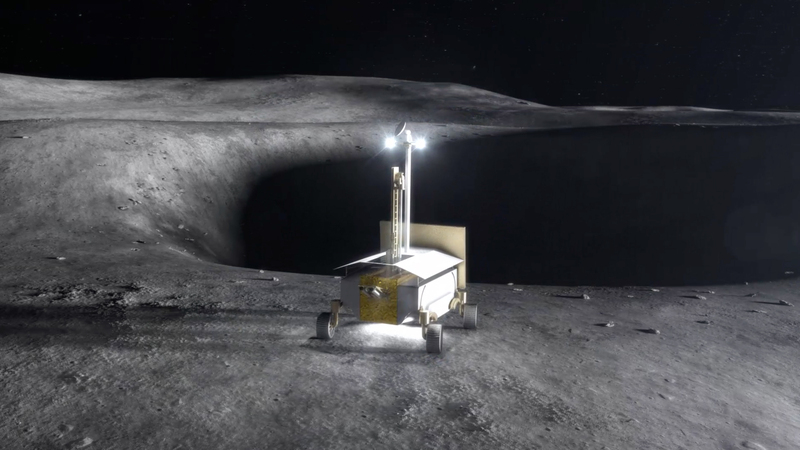 The RESOLVE experiment also will identify important minerals, such as iron, that could become important resources for lunar-based manufacturing in the future. In this concept image, an astronaut takes samples of an asteroid that has been robotically captured and placed into a lunar orbit. Asteroids rich in resources also could prove to be useful as waypoints for deep space journeys. NASA’s upcoming Asteroid Redirect Mission (ARM) will move a near-Earth asteroid into orbit around the moon, which astronauts will explore in the 2020s. In addition to testing new technologies needed for human missions to Mars, ARM could open new opportunities for asteroid utilization, like mining resources that could be turned into propellant, consumables or radiation shielding in the not-too-distant future. NASA has initiated concept studies to examine how to harvest these resources from asteroids, in a weightless environment. In our lifetimes, ISRU is poised to make exciting breakthroughs on any target of human exploration. With raw materials astronauts could build infrastructure like launch pads and radiation shielding that will further reduce dependence on Earth supplies and protect the crew. Perhaps the most profound moment, though, will come with the first breath of fresh air made on another planet. For the latest on NASA’s ISRU development, follow: http://www.nasa.gov/exploration and http://isru.nasa.gov.